Described as among the most controversial documentaries in the history of cinema, Sheldon Renan and Academy Award® nominee Leonard Schrader’s (Kiss Of The Spider Woman, Mishima, Blue Collar) The Killing of America is a graphic and provocative examination of America’s history, complete with senseless violence, mass shootings and cold-blooded murder. Never distributed, televised or made available for sale in the United States, this provocative documentary now arrives in the UK, courtesy of Severin Films, in a fully restored edition. On 31 October, the first ever UK Blu-ray release of the infamous ‘shock doc’ arrives loaded with exclusive special features – including the even more unnerving Japanese version known as Violence U.S.A. – which remains one of the most profoundly disturbing and still chillingly relevant documentary experiences of our time. A DVD version will also be available. 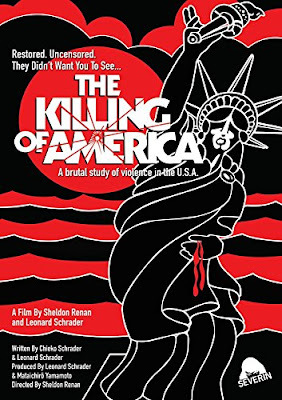 The Killing of America - Severin Films Trailer from Severin Films on Vimeo.